A dealer in "outsider" art travels from Chicago to North Carolina to meet her new in-laws, challenging the equilibrium of this middle class Southern home. For Which Film Should Amy Adams Have Won An Oscar? Bobby Tisdale ... Norman Venable at Replacements, Ltd.
Ashley: I can't sit down! I'm too excited! "Junebug" is one of the best independent movies that has been released recently. Phil Morrison, the director, is clearly a new voice in the cinema to be reckoned with. His immensely satisfying "Junebug" has the power to make the viewer gets absorbed into the drama he presents to his audience. Based on a screen play by Angus MacLachlan, the film is a pleasant surprise. If you haven't seen the film, perhaps you should stop reading here. At the start of the film, we are taken to Madeleine's gallery in Chicago where an art auction is taking place. The lovely Madeleine is seen behind the scenes, when she suddenly happens to catch sight of George, who happens to be at the event. We are aware of Madeleine's lust for the handsome George, and as fate would have it, they get married. When Madeleine decides to go to visit one eccentric painter in North Carolina, a visit to George's family is in order. The contrast between the worldly Madeleine and her new in-laws is something we realize right away. The mother, Peg, is a controlling woman who presides over the big household. She is weary of strangers, as she perceives Madeleine to be. The father, Eugene, is a taciturn man who clearly wants to stay away from his wife, hiding in the basement, where he carves animal figures that we never get to see. Johnny, the other son, seems to be resentful of his brother for having left home. His wife Ashley, is the only person who seems to be happy, or at least, adjusted to her situation and surroundings. The basic trouble with this family is that they don't communicate. Nothing is ever heard about what has made them grow apart. There is no warmth whatsoever from Peg toward anyone at all. In fact, for being this a Christian family, they exhibit no kindness toward Madeleine, who tries to connect with them, to no avail. Johnny misreads his new sister-in-law's kindness with sexuality, which is clearly not the case. It's only Ashley, the simple girl with a heart of gold who seems to be having some semblance being well adjusted in spite of the coldness of her new home. Amy Adams and Embeth Davidtz, who play Amy and Madeleine, respectively, give amazing portrayals of these two opposite women. Ms. Adams is one of the best things in the film because she hasn't been touched by whatever is making the rest of the family so miserable. 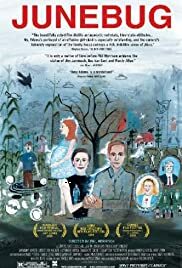 Embeth Davidtz, one of the best young actresses working in film and in the theater these days gives a graceful account of Madeleine, a woman of a different background who is accepting and wants to be accepted by her new family. The rest of the cast is well balanced. Benjamin McKenzie is seen as the frustrated Johnny, who is clearly an unhappy man living with his family. Alessandro Nivola has a great moment when he is asked to sing a hymn at a church gathering. Celia Weston makes Peg, into a mystery, as we can't conceive her reaction toward the woman who married George and can't accept her. Scott Wilson is the father. "Junebug" is a film that will stay with the viewer for quite a long time after it's finished. Mr. Morrison makes us get involved in the situation he is presenting for us. Clearly, not a film for the great masses, but it will gratify fans of this type of indie that shows a director who clearly has things under control and is not afraid to get the viewer involved in the story. 52 of 74 people found this review helpful. Was this review helpful to you?